Lay half orange fat and remove peel with curved downward cuts, exposing flesh. Cut 1/2 orange into bite-size pieces. Crumble vegetable bouillon into boiling water. Add black lentils and stir. Simmer 20-25 minutes, or until lentils are tender, stirring occasionally. Strain, then return lentils to pot. Add carrots, zucchini, and onion to hot pan. Cook 5 minutes, or until carrots are tender, stirring occasionally. Add reserved garlic and stir. 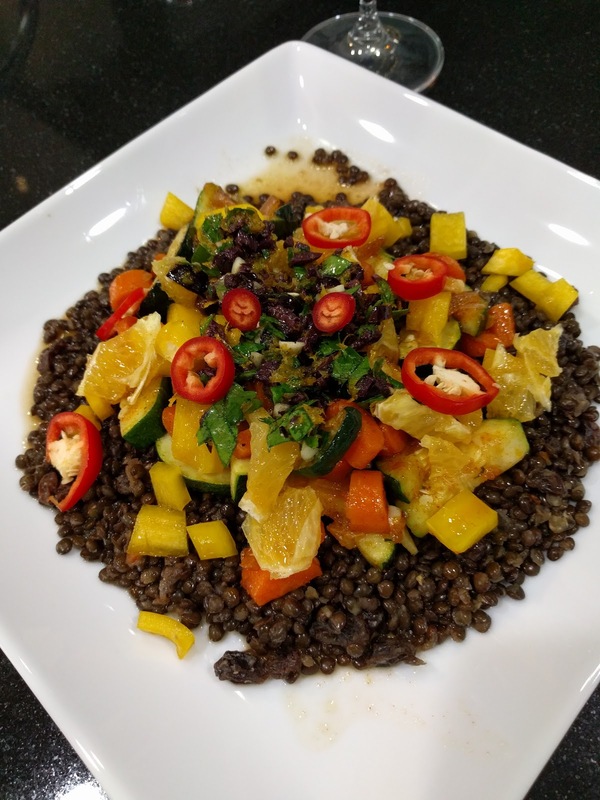 Squeeze juice of half orange over over lentils, avoiding seeds. Add 1-2 tablespoons olive oil bowl with citrus vinaigrette base. Top with yellow bell pepper and orange. Drizzle vinaigrette over bow to taste.